Dnipro (USA) («Дніпро»; Dnieper). Illustrated biweekly magazine, organ of the Ukrainian Orthodox Church in the USA. 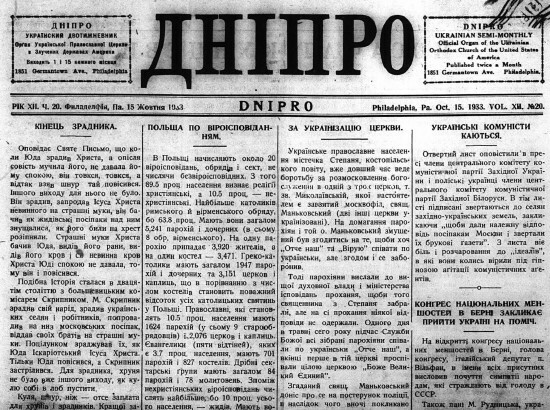 Dnipro was published from 1922 to 1950, at first in Chicago (1922–6), in 1927 as a monthly entitled Siiach, and subsequently in Philadelphia (1928–50). The editor of Dnipro was Rev Petro Bilon. In 1950 the magazine was replaced by the monthly Ukraïns’ke pravoslavne slovo, which has since been published in South Bound Brook, New Jersey.